Is this 1921 cartoon the first ever meme? Is this 1921 cartoon the first recorded meme? When this comic was posted to Twitter, it caused excitement as people began to wonder if it was the first meme - a format-dependent joke, typically of a picture with a caption or subtitle - ever published. But we've found a version of the joke using the same format printed at least a year earlier in either 1919 or 1920. Both draw from the same template of the 'Expectations vs. Reality' joke, which contrasts two pictures side-by-side with an obvious discrepancy between them. How do you pronounce 'meme'? The comic was first posted to Tumblr by Yesterday's Print - a user that shares historical content to "highlight the parallels of past and present". It was subsequently reposted with new captions such as "you/the guy she tells you not to worry about", referencing yet another contemporary template meme. Some users created their own takes on the format using other memes such as 'If You Don't Love Me / Can't Handle Me'. The comic was found in a 1921 edition of satirical magazine The Judge, published by the University of Iowa. Within The Judge, the comic is then credited to a different magazine - the Wisconsin Octopus, published at the University of Wisconsin between 1919 and 1959. By looking through the University of Wisconsin-Madison Libraries, we were able to view a few early editions of the Wisconsin Octopus magazine, and found this is not the first time the 'Expectations vs. Reality'-format joke appeared in print. Dawkins called memes "ideas that spread from brain to brain"
Is it 'the first meme'? According to the definition, a single image cannot be a meme. It has to be copied and spread with variations to the original image. So on its own, the 1921 comic is not a meme. 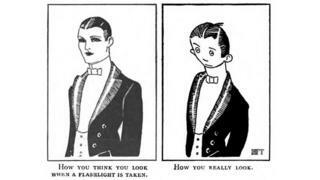 But coupled with the comic from either 1919 or 1920, it begins to fit the definition, as the two comics are variations on the same style - using two panels and captions to set-up an expectation and contrast it with reality. While we can't say with certainty that this is the first meme by that definition, we can say that because it was copied and spread with variations this cartoon was genuinely part of a pre-internet 'Expectations vs. Reality' meme. Clearly the writers of the Wisconsin Octopus magazine were ahead of their time.